The Stanley 1000 Peak Amp Jump Starter offers a convenient, portable way to jump-start your battery without the need of another vehicle. Simply attach the clamps and if connected improperly the alarm will sound, alerting you to switch the clamps before turning on the unit. The jump starter provides 500 instant cranking amps and 1000 peak cranking amps. The jump starter includes 12-volt and USB outlets plus a built in 120 volt AC charger. With heavy duty metal clamps and Number 6 AWG cables, the unit is as safe as it is reliable. It also features a high powered LED light that rotates 270 degrees and a charge indicator. With enough power to jump-start your car, truck, motorcycle, boat, RV or tractor. 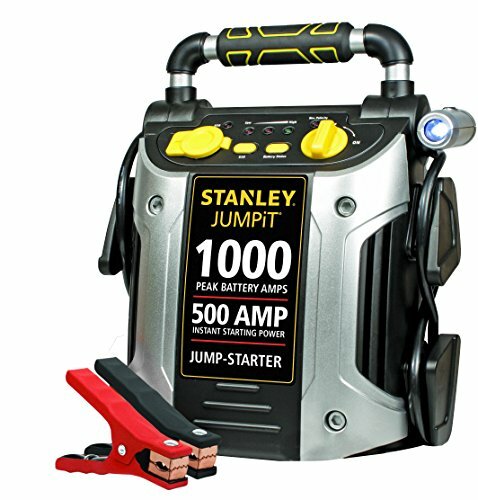 The Stanley 1000 Peak Amp Jump Starter is ideal for everyday use or roadside emergencies. *To use and access the the charging feature of the J509 lift the AC adapter cover that is located on the back of the unit and connect an extension cord to the unit (extension cord NOT included). Plug the other end of the cord into a standard 120 volt AC wall outlet. Charge until two red and one green LED Battery Status Indicators light. Once fully charged, disconnect the extension cord. All batteries lose energy from self-discharge over time and more rapidly at higher temperatures. When the unit is not in use, we recommend that the battery is charged at least every 30 days.